I love all things old made new again! Don’t we all deserve a second chance? Over the last few weeks, I have received two gifts that have won not only a place in my wardrobe but also a place in my heart. They have such a fun story behind them, and on any given day they can be the perfect finishing touch for accessorizing my outfit. I have been noticing and admiring many artists and jewelry designers who are following this creative trend in crafting statement pieces from antique jewelry and heirloom treasures. With valuable finds discovered everywhere from estate sales to flea markets to thrift stores, it’s amazing the reclaimed art that is crafted from items that probably sat unnoticed for many years. I’m sure there are mothers and grandmothers who wish they only knew then what they know now and would have kept the many keepsakes they may have given away. 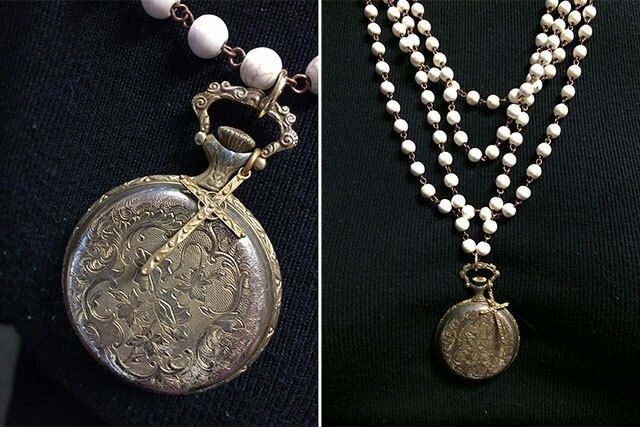 My first piece is this gorgeous old pocket watch that hangs from a multitude of marbled pearl beads strung with a simple bronze wire (pictured above). One of my editors wore something similar that I had admired, and she surprised me with my own. This past Christmas she made all of her sisters and friends necklaces and bracelets from reclaimed pieces. It’s just her latest fetish in crafting and creating with her hands. She told me she found the chains for me a month or so before she found the watch; she was looking for that ever-perfect piece to complete the look. She added a dainty cross as the finishing touch, stating the trend is to layer and mix unexpected and charming pieces. 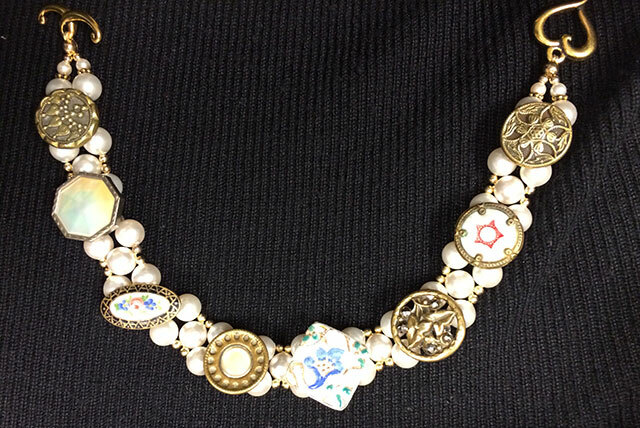 Another gift came this week from Frances Casey who has a full line of unique jewelry designed around Victorian-era buttons. The name of her cottage industry is Button Jewels. Over the last 14 years she has traveled all over Europe to gather these treasured buttons. You can see more of her artwork at buttonjewels.com. Do you have any favorite designers I should know about? Share them in the comments! Your article was so very timely! Last week I was cleaning out a bureau drawer while looking for a different article, and there was the brooch watch that had belonged to my Irish grandmother, Nora. My father had given it to my sister, also named Nora. It was passed on to me after my sister’s untimely dearh. I showed it to my son, told its story, and vowed to wear it myself. Also, I have a ladies watch on a chain I stumbled upon on a trip through a thrift shop. I really enjoy remembering my wearing it when I was a new teacher. Your sharing brought these items back into my mind, and reopened memories of these two special women who influenced my life., and my days of teaching young people. In the ensuing years, these precious women have been a part of me that I sometimes have overlooked. Thank you, Phyllis, for the smile I have now as I see them in my “magic mirror of memories”! I would love to see an article on old charm bracelets! Last year I simply hooked together both my two grandmother’s bracelets, my own and my Moms….with no alteration. I wear it As a long necklace or sometimes a shorter one hooking the extra bracelet across the lower third of the three hooked together making a double necklace. Phyllis, I cannot tell you how many people notice this necklace! The old charms are beautiful and each one has a story about that person, so it always sparks a sentimental conversation when someone notices. It also helps me remember about my family also. I love using older family jewelry and love finding ways to wear it! Thanks for the post! You have given me some new ideas for my grandmother’s vintage jewelry today. Thanks Phyllis! I make Memorial Bracelets out of old watches. I usually take an old non-working watch, remove the insides (or works) and downsize a picture of someones loved one to place inside. They have been very well received. I make new jewelry from old things. My favorite things to use are sterling tea spoons. Please send me your address in a private email. I would love to make a necklace for you. I have made a spoon necklace for Paula Deen, Aunt Peggy and Bubbles. I call my jewelry making my therapy. This is truly an interesting way to wear antique jewelry and will inspire me to pull out some of the many such pieces handed down to me from my grandparents and parents. What a wonderful article. I have beautiful buttons, some old watches and jewelry – some are my things and others belonged to favorite people in my life. I now know what I am going to do so I can love and enjoy these things once more. Thank you for your blog. 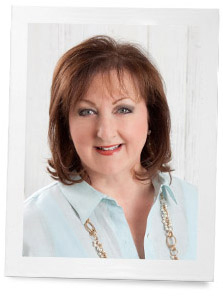 Oh my goodness, if you love these sorts of treasures, you MUST check out Paula Montgomery. NO affiliation whatsoever, just a huge fan. I am blessed to have three of her creations! I just ordered a bracelet from Paula Montgomery. Thanks for the information. 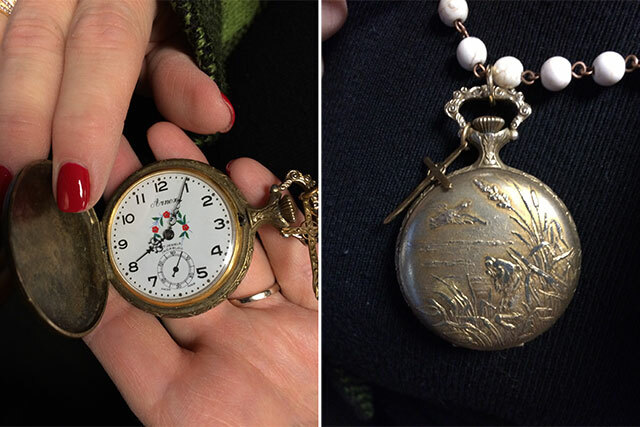 Perhaps I can design a new way to wear my grandmother’s pendant watch, It has a little school house etched on its cover–given to her by her students when she left teaching on the plains of Nebraska in the late 1800’s. I . too began my career as a teacher. I will look forward to more of your ideas in the future. I, too, have an old locket-type watch like yours that an elderly friend gave me years ago. She’s deceased, now, and wearing this charming (she called it “wacky”) keepsake on a chair against a black or grey wool dress will honor and please her, I’m sure. Your journal entry inspires me to raid my husband’s father’s jewelry box to see what else I find and make pieces into keepsake jewelry for my daughters and granddaughters. I bought a necklace from a boutique made by a girl from vestavia. The name of her business is Made In The Deep South. It is multiple strands of old chains from the 60’s and 70’s with a brooch. It is gorgeous and I love that it is made from someone’s old jewelry. Thank you for the great compliment Penny! We so appreciate support from our fans! Phyllis we would love for you to take a peek at our one of a kind jewelry line. Here is the link to our website http://www.madeinthedeepsouth.com . You will find a small sampling of photos there and link to our facebook tkhat has thousands of photos. My daughter Sue makes pins and pendants from old jewelry pieces. They are very unique and beautiful. I also received a gift from my daughter Chris who covered a glass jewelry box with many old pieces of jewelry. It is lovely. This is such a fun blog. Keep it coming. I would love to see a picture of these items. They sound beautiful. My dear friend Lisa Lohman designs jewelry and is so talented at it. She creates from new beads and findings, but from time to time she will work with something old and come up with a wonderful design. I love her earrings as they are always different than anything I see when I am out shopping at a mall or at a antique store or vendor show. I love the necklace!!! Can you do article on step by step how to’s? I too love the old pieces. This Christmas I gave my daughter, age 36 and my two granddaughters, age 8 and 4 each a gold locket with chain for Christmas. Each locket was worn either by me, my mother or my daughter when she was small. Everyone, loved their locket. I also go to a beautiful shop in St. Francisville, LA not far from me in Natchez, MS. The shop is called Grandmother’s buttons. I have several pieces from there. Love hearing from you each day. I love this! So fun and amazed at how you can find some really beautiful things when you least expect it. And, yes, definitely a statement piece. Love this magazine! You bring beauty and dreams to life. I may not have the items discussed in the articles but I admire them so very much. This magazine takes me places where I could not get to. 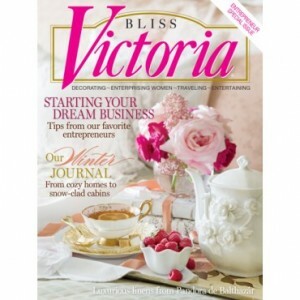 I have only one magazine that I cherish and that is Victoria. Thank you for keeping the beauty and mystery alive in my world. I couldn’t agree more, Deborah… ! My sister makes jewelry from old buttons and old jewelry as well. It is so fun and adds new life to old pieces.